NECOFS is being developed by the UMassD-WHOI research team led by Drs. C. Chen and R. C. Beardsley as one component of the Northeast Regional Coastal Ocean Observation System (NERACOOS) with an initial infrastructure support from the Massachusetts Fishery Institution (MFI). 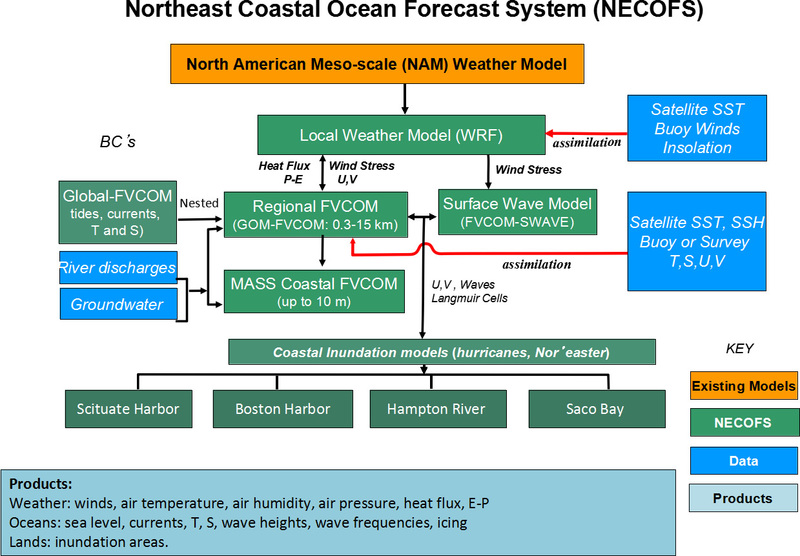 The major components of this forecast system include: 1) the modified mesoscale Weather Research and Forecast (WRF) model; 2) the regional unstructured grid Finite-Volume Community Ocean circulation Model with configuration of the Gulf of Maine and New England Shelf (GOM-FVCOM); 3) the regional unstructured grid surface wave model (FVCOM-SWAVE) modified from SWAN; 4) the nested Massachusetts coastal domain FVCOM, and 5) four fully current-wave coupled coastal inundation models for Scituate, MA, Mass Bay/Boston Harbor, MA, Hampton River, NH and Saco Bay, ME. In both forecast and hindcast operations, WRF produces the surface meteorological forcing fields to drive the GOM-FVCOM and FVCOM-SWAVE. A 24/7 forecast operation is performed to produce a 3-day prediction of winds, air temperature, air humidity, air pressure, sea surface heat flux, evaporation and precipitation, sea level, currents, sea temperature, sea salinity, wave heights, wave frequencies, wintertime icing and storm-induced inundation areas. The hindcast is carried our daily and monthly to produce the reanalysis hourly products. The monthly hindcast operation is conducted through a nesting to the Global-FVCOM, with nudging, optimal interpolation and advanced Kalman filters to assimilate SST, satellite-derived insolation, and in-situ oceanographic data (moored and shipboard hydrographic and current data).